My dear friend Nancy-Josephine and her husband Patrick made the move to Goleta in Santa Barbara this past weekend. We spent our Thursday evening gathered with friends in their humble cottage tucked away in Old Town. Nancy had a bag full of clothing and holiday decor that she was giving away. I coveted a knitted black turtleneck sweater that I am o so eager to throw on when the weather drops. 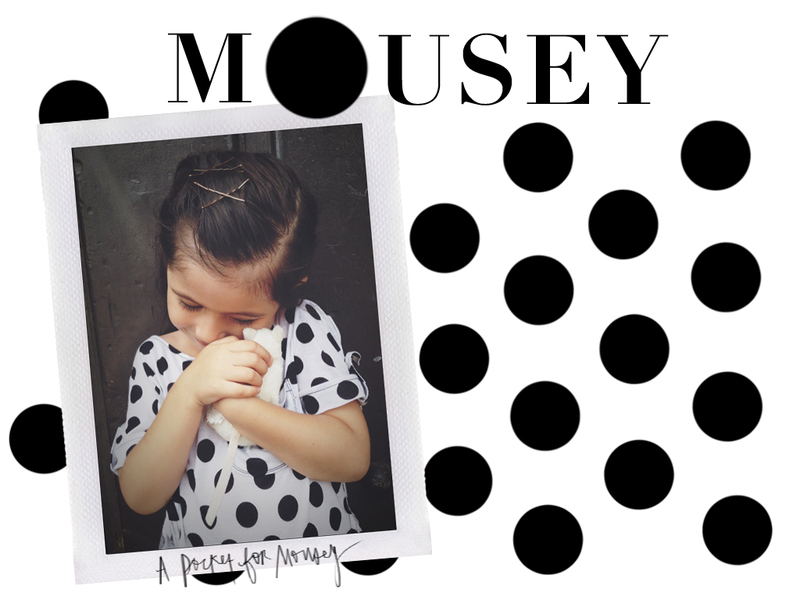 Evie adopted a stuffed mouse, now going by the name of “Mousey.” She is fond of little creatures, and once she gives them a name, it becomes a part of the family. Evie’s hair is getting very long, and I have been growing her bangs out so it can be pulled back for ballet. When daddy undoes her braids and buns at the end of the day, he likes to say, “Bobby lives in your hair!” (meaning: why do you have a dozen bobby-pins in your hair?) 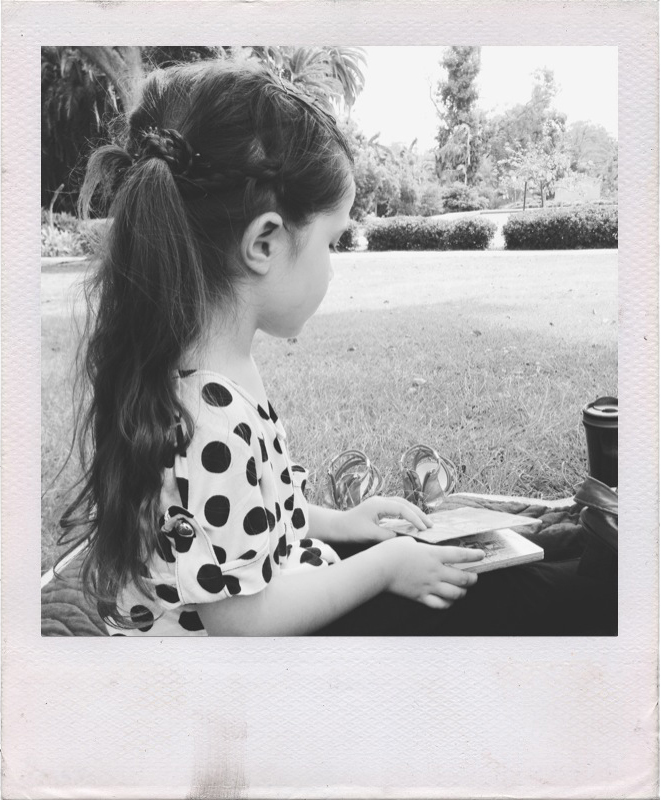 I never quite understood why they make brown bobby-pins, until I had a daughter with brown hair, and then it made a lot of sense. We have our own tiny jars in the bathroom; one full of Bobby Blacks, and one full of Bobby Browns. Bobby has been serving his purpose during this unbearable heat-wave, and we never leave the house without a troop of him standing by. Despite the temperature rising as we near the end of Summer, my thoughts have already moved on to fall and winter projects. I imagined our fall full of dots, and it hasn’t been easy looking for a polka dot knit. Evie loves polka dots, and I think it’s because of Minnie Mouse. It couldn’t have been more ironic that on this day she had Mousey. The woman at the fabric store told me that these polka dots just came in and I may have been one of the first to buy a yard of it! I was tempted to buy the white dots, but Evie preferred the black dots… of course it was the better choice. When I made this shirt this past Friday, we were on our way to Auntie Bee’s surprise birthday party at Mission Bay. 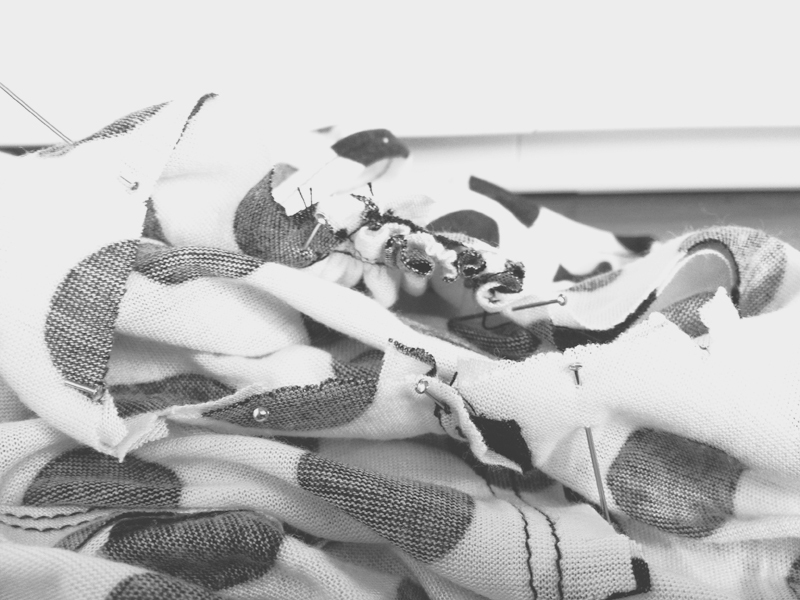 She had just awoke from her nap and I had just finished modifying the stitches at the hem. Her eyes widened when she saw her new polka dot shirt with a big patch pocket on the front. She immediately gathered 1. A painted wooden duck that daddy gave which he got from Korea 2. Lip gloss — and dropped them into her pocket. Her head would nod down every few minutes to make sure that they were right there where she put them. Patch pockets are quite simple to make, and I will have to add them to several more of her shirts because of her affection for holding her treasures close to her heart. 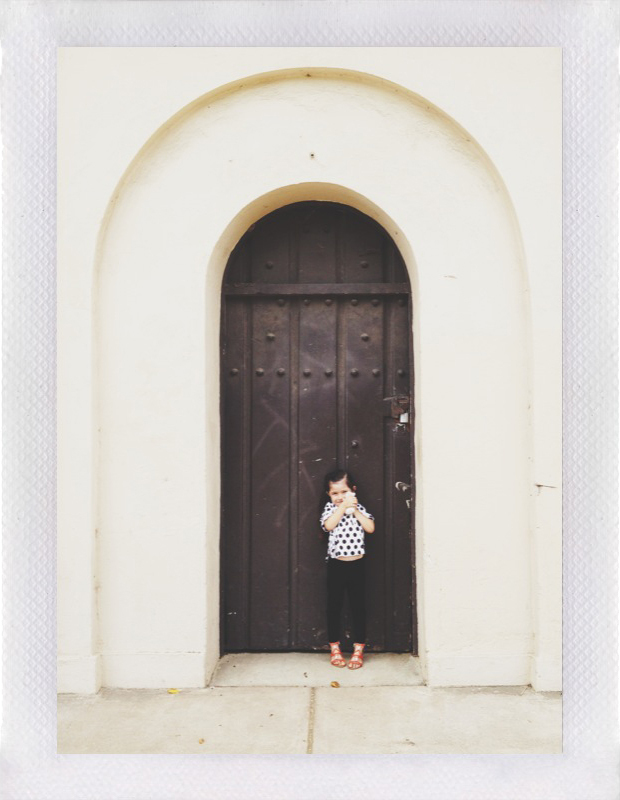 This entry was posted in Balboa Park, DIY, Fashion, Life, San Diego and tagged Baby, Balboa Park, Childrenswear, Evie, Fall 2013, Fashion, Girls, McCalls's Patterns, Mouse, Polka Dots, San Diego, T-shirt. Bookmark the permalink. I like how you made Evie’s hair. Really nice! She is really nice as well of course. 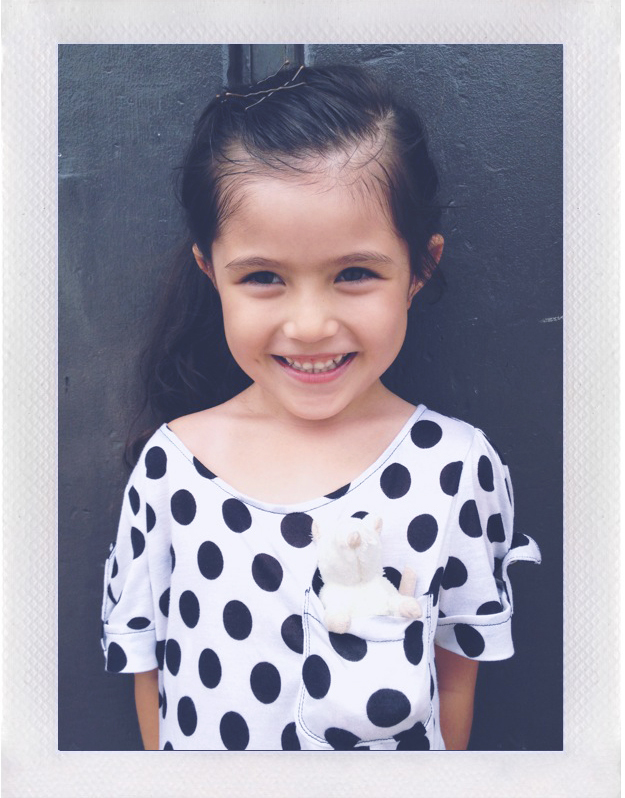 The dotted Tshirt is very trendy and you are so thoughtful to have made pocket for Mousey! Oh and I liked the playfulness of the red sandals on Evie. The pictures are also gorgeous: did you take them? I am Eszter by the way. Nice to meet you Jena! Nice to meet you too Eszter! Thank you for all of your sweet compliments 🙂 I do take all of my own pictures of my projects, and I use nothing fancy, just my iPhone! I try to take them all under natural sunlight, so that I don’t have to do major editing. Most of my pictures are filtered with an app on my phone. Usually the photos I take in my home need to be edited in photoshop because of how dark it comes out even with the sunlight coming in through the window.